Wendy's has been a constant on Georgia Ave for a very long time, and is loved by many. I first noticed Wendy's when I moved to Petworth, as it was the only fast food in the area (excluding places like Dannie's or China American Inn). Hands down for me, it's spicy chicken sandwich (#6 on the menu), with extra pickles. The spicy chicken sandwich… these things never, ever look as good as the marketing photos. I sat down with Shoshana and Lauren to talk about why they created the WendysonGeorgia Instagram account. They said the idea came to them because they live near the Wendy's and see the burger joint right out their window. They started the parody account soon after they moved into their shared apartment this past fall (they previously lived on 14th Street). We met for the interview at Wendy’s and grabbed lunch. Of course, I got the spicy chicken sandwich, while Shoshana got chicken nuggets and Lauren went for something colder. "Yeah, I’m having ice cream for lunch, but since we're at Wendy's, it's just called a Frosty, so it’s fine," she said with a laugh. The idea for the Instagram account came from staring out their window at the Wendy’s. Shoshana said the idea started with Lauren commenting when the drive-thru lane got crowded “Oh look, we’ve got a snake!” (Meaning the line is snaking around the building and parking lot.) Shoshana, who’s a fan of Twitter, thought it would be fun to create the account. First it started as a fun distraction, and now has become part of their shared fun hobby. Soon after they started the Twitter account, they moved to Instagram. "I think 2 people mentioned Instagram to us, and at the time that was half of our followers," Lauren said laughing. "And you have to give people what they want." “We definitely get more engagement on Instagram,” said Shoshana. “On Twitter, we'd get a couple of likes, maybe a retweet. But now we can get more so many views on our stories, and we're able to engage more with other DC restaurants and places in the area." "We like to follow the Michelin rated restaurants and compare ourselves to them," Lauren said, with a smile. "They don't have the same… smell… this place does, though, do they?” I asked. "We're very different for many reasons,” Lauren said. “But similar length lines, sometimes, as Himitsu, Wendy's has." There really isn’t a price comparison between the two, of course. Wendy’s isn’t known for its critically reviewed cuisine, but for being fresh… and open at odd hours. The Wendy's on Georgia is the only place open very late along the stretch of Georgia Avenue all night long. "People love this Wendy's. It's one of the few in the city," Lauren said. 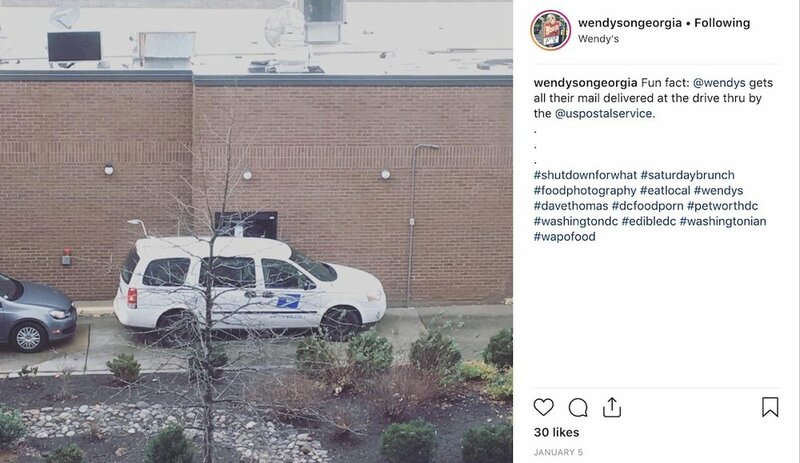 "I think the Instagram account tells a story about the neighborhood... that meal times aren't necessarily the most popular at Wendy's.” (This explains why they wanted to meet me at noon at Wendy's... they said it wouldn't be crowded, and they were right). “But late night, it's insane. Sunday late night, especially," she added. Shoshana is originally from Los Angeles. She moved to DC for a “year of service” program after college, and decided to stay. She’s been in the District for three years, working in communications. Lauren is from Austin, Texas. She moved to DC 10 years ago for college, meant to leave when she graduated but fell in love with DC instead and never left. She recently worked at Discovery in Silver Spring doing market research until accepting a new job. She travels a lot for work, which she says is giving them an opportunity to expand what they do with the parody account. "So we're trying new things... Wendy's on-the-go, or research on other places,” she said. They said they're looking at ways to keep the account fresh (like Wendy's...). They are thinking of continuing a "Good Night" series... "People liked that." Maybe, they said, they’ll start a "people of Wendy's" series... but haven’t had much success approaching customers. Lauren and Shoshana enjoying a Frosty during the noon-time lull at Wendy’s. While they’re happy with what response they’ve received so far, they said they haven't gotten the notice of Wendy's main corporate account yet, but other smaller Wendy's accounts from international Wendy's have liked some of their photos. Hey, it's a start. Besides Wendy’s, they said they’re also big fans of Colony Club, Call Your Mother, Reliable Tavern, Homestead (love their brunch) and Capitol Cider House. For the future? Lauren said they want to know what people are interested in... "We post about the new specials on the board out front (it's only been twice)…” This way, they said, people can know what Wendy’s is offering before they go down to the restaurant. "You were home once when they were putting up the letters,” Shoshana said, looking at Lauren. "It was exciting!" Lauren replied, laughing. They’re definitely getting a kick out the account, and enjoy entertaining their followers.